A fierce game of football that sees two sides looking to score at opposing ends of a town is under way. 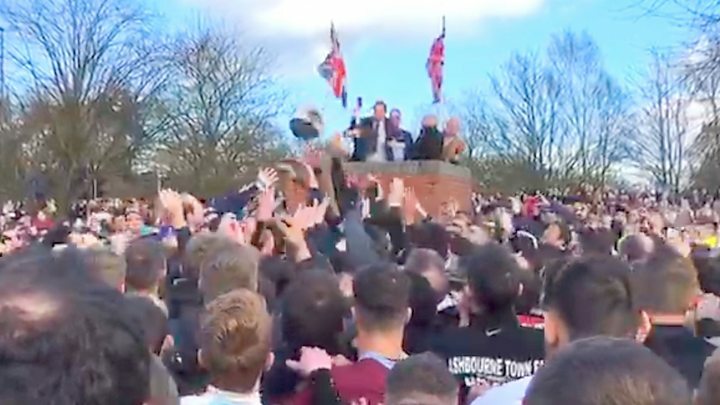 The traditional Royal Shrovetide Football in Ashbourne, Derbyshire, sees the Up'Ards and Down'Ards compete to move a ball to posts at two ends of the town. A turning up ceremony at 14:00 GMT on Shrove Tuesday started the contest, which is due to finish on Wednesday. Last year's edition of the centuries-old game ended in a 1-1 draw. Simon Fisher, 30, a builder from Ashbourne, has been playing for the Up'Ards - those born on the north side of the Henmore River - since he was 15. He said he scored eight years ago and felt "euphoric". Mr Fisher said: "There's no real feeling that comes close. "Probably having children and getting married, that's probably as close as it gets. "It's something you dream about as a kid." Down'Ard Davina Harrison, 61, who attended the Shrovetide festivities with her father Nick Blood, said: "I was brought up with the game right from an early age, dragged along by my mum, about five years old probably, to watch it. "In the middle of the hug mainly the women stay away because it's so fierce and it takes a lot out of you. "I'm carrying water today because the lads will be so exhausted." Duncan Burnham, 48, and his partner Helen Dickinson, 43, travelled from Burnley for Shrovetide. Mr Burnham has been attending the matches since he was 21. He said: "My daughter is 10 years old now and she was born the day before Shrove Tuesday. "I actually managed to get a day off to come down. I left her in hospital to come down to the football, so I'm a very keen follower." Pancake Day Quiz: How much do you know about Shrove Tuesday?